Overview: Thunderstone , along with the expansion Wrath of the Elements , is a deck-building game. Each player starts with a few basic cards, which they use to collect new weapons, spells, villagers and heroes. Once they’re sufficiently armed they attempt to defeat the monsters in the dungeon in an attempt to capture the powerful Thunderstone. Rating: Monsterrific, but with some flaws. Will You Like It? Fans of dungeon-crawling and monsters will enjoy it once they get past the attractive-but-user-unfriendly card design and clunky rulebook. From what I’ve been told, Thunderstone has some similarities to Dominion (which I haven’t played yet) but is nothing like Magic: the Gathering. Will Your Kids Like It? I think the age rating is pretty accurate on this one—it’s a bit complex and I wouldn’t recommend for younger kids. And again, depends on your kids’ affinity for fantasy and monster-slaying heroes. Cards and dividers in the Wrath of the Elements box. 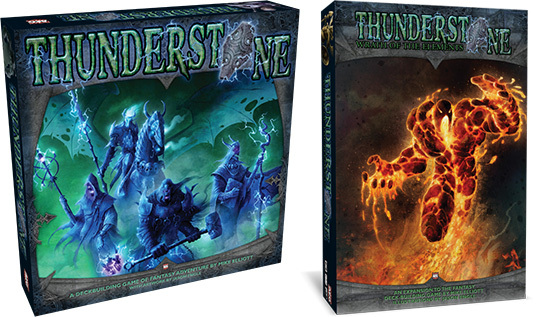 Thunderstone is a game that is made up entirely of cards: the base game comes with 530 cards, and Wrath of the Elements adds another 340. Add in the card dividers, and you have a pretty hefty box. The cards themselves are pretty good quality, about like any other typical cards. The artwork is excellent and really helps set the mood of the game, from heroes of various races to magical weapons to the nasty monsters you’ll encounter. However, the layout of the cards could have been a little better. Each card has various numbers on it, representing things like gold value, victory points, strength, purchase cost, level, light value, cost to level up, weight … as you can see, a whole lot of things to keep track of. Unfortunately, the way the cards are designed, most of these are represented with a little number in a colored circle. The gold value is easy: it looks like a gold coin. But remember which number on a monster card is health or victory points or experience points can be pretty frustrating—is it the purple circle or red circle? You would think it wouldn’t be too difficult to add a few labels or icons to distinguish the cards. It’s similar to the problems I had with another AEG game, Myth: Pantheons—another game I enjoyed except for the presentation. Finally, a word about the boxes—if oversized boxes don’t bother you, then just skip to the next section and ignore my ranting. The base game comes in a huge square box with a plastic liner, which has more spaces than are required for the cards included (and are divided up into different-sized stacks which I never quite figured out). It also comes with 50 divider cards to help you separate the cards—however, these dividers are only a hair wider than the regular cards, plus they look exactly the same as the card backs, which makes them close to impossible to use. The expansion comes in a slightly smaller box (pictured above)—and there are too many cards to add to the plastic divider in the base set. However, they also come with new, wider divider cards, labeled with the various types of cards. They even include an image on each one to distinguish the cards from the base set and the expansion. The new box is also big enough to hold both games with a little room for expansion (and some foam cubes for placeholders). It’s almost worth getting the expansion simply to have the right-sized box and dividers … except the rulebook for the base set is too big for the box. I actually ended up cutting a quarter inch off the edge of the rulebook so it would all fit. In short: the expansion fixed a lot of the packaging problems I had with the base set, except for the oversized rulebook. 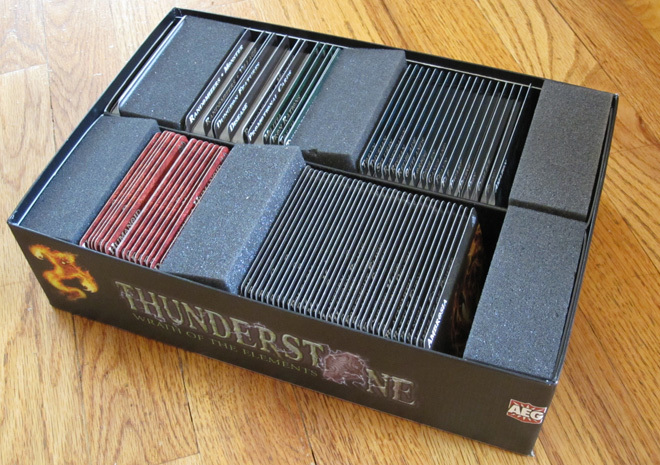 Thunderstone: set up and ready to begin! 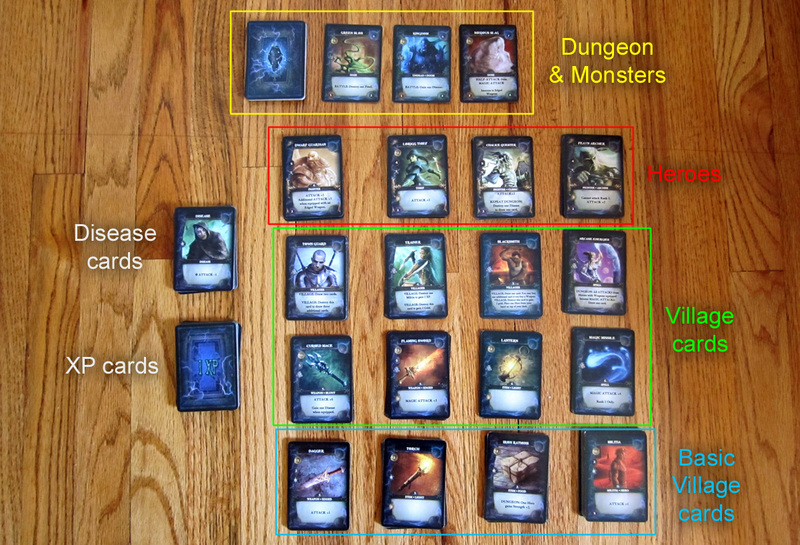 The game is set up with a Dungeon—usually consisting of roughly thirty monsters in three different categories—and the Village: four types of heroes, four basic Village cards, and eight other Village cards. (See photo at top.) Each player starts with a deck of twelve basic cards: Daggers, Iron Rations, Torches, and Militia. On each turn, the player draws six cards from their deck and uses that hand of cards to visit either the Village or the Dungeon. At the beginning of the game, most players will go to the village because nobody has enough firepower to go after anything but the weakest of monsters. In the Village, the gold value of the cards can be used to purchase other cards, including the Hero cards. Village cards can be weapons, spells, and townspeople who give additional abilities to the player. After gaining experience points (by defeating monsters) they can be spent in the Village to level up the Heroes, making them stronger (and, at Level 3, making them worth victory points). All of the cards you purchase eventually get shuffled into the player’s deck. To fight a monster in the Dungeon, you must have enough attack points (through Heroes, weapons, and spells) to equal the monster’s health. In addition, you must have enough light to overcome the light penalty, which is greater for the monsters deeper in the dungeon. Any light penalty you cannot cancel out is worth two attack points. Finally, the monsters themselves may have additional battle effects—some require regular attack or magic attack only; some will destroy a card from your hand during battle; some may force you to draw Disease cards, which weaken your attack. If you attack a monster but don’t have enough points to defeat it, the monster retreats into the dungeon, all the remaining monsters move up a rank (closer to the light) and a new monster emerges. The key to Thunderstone is building up your deck and weeding out weaker items so that a random draw of six cards will give you a good chance of defeating a monster in the Dungeon, or at the very least give you a lot of gold to spend in the Village. The game ends when the Thunderstone (shuffled into the bottom ten monster cards) moves to the top rank of the Dungeon, and then the player with the most victory points wins the game. The Wrath of the Elements expansion adds some new heroes, items, and monsters, but also throws in some traps which range from the inconvenient to the really nasty. There’s also the Doomknight Champion who actually comes up out of the Dungeon and starts destroying your cards until he’s defeated. That’ll put a kink in your plans. Between the non-intuitive card design and the complicated rulebook, I almost gave up on Thunderstone before I ever tried it. The main issue with the rulebook is, actually, the basic setup for “Your First Game.” When I got to the section on Setup that said “If this is your first game…” I turned to page 3 as directed and tried to set up the game based on the list of cards and the accompanying diagram. However, that didn’t really explain why there were so many similar-looking cards and it was rather confusing. When I finally went back and read the entire setup, I realized my mistake and things started to click. Still, it’s a lengthy rulebook and the first time you play, expect to spend roughly double the advertised 45 minutes to play the game. However, once you get going, it can be a pretty fun game. The GeekDad contingent at PAX played the basic game once, and then a few of us played the Wrath of the Elements expansion the next night. What we found was that the mix of cards can make a huge difference in the feel of the game. Although I used the basic setup for the expansion, I think they were trying to give you a feel for all the new stuff but it felt very unbalanced—we ended up with a Thunder Wrath at the top of the Dungeon, who just sat there taunting us for round after round because we couldn’t build up the right combination to defeat it. What had felt like a fun-but-challenging game turned into an exercise in futility. The balance of cards in the setup is crucial. Next time I play, I plan to try out Thundermaster, an online “intelligent randomizer” which helps you select a good balance of cards. There’s also the iPhone app iThunderstone which performs a similar function, although I haven’t used either so I can’t report on their performance yet. Either way, I enjoyed Thunderstone enough that I’ll definitely be braving the Dungeon again. Wired: Fantastic artwork, tremendous replayability, great theme. Once players are familiar with the game, it’s a nice weighty game that doesn’t take too long to play. Tired: Poor card layout and less-than-stellar rulebook raises the barrier to entry. The initial card selection can make or break the experience. Disclosure: AEG provided a review copy of the game.